Over the past 18 months, the Russian company has paid about $3.5bn to the Kurdistan administration including $400m to develop five exploration blocks; $1.8bn for control of the region‌s export pipeline, and a $1.2 loan in pre-payment for oil produced by companies other than Rosneft. When the Iraqi autonomous region of Kurdistan went looking for someone brave enough to pump billions of dollars into developing its large oil and gas reserves, it found a man who has never been accused of lacking courage: Igor Sechin, an old friend of Russian president Vladimir Putin. The chief executive of Rosneft, Russia‌s state-owned oil company, has ignored fears of conflict, criticism from western powers and navigated a web of regional, religious and political associations to emerge as Iraqi Kurdistan‌s single biggest financier. In the process he has moved a US military stronghold much closer to Moscow. Rosneft, the world‌s largest publicly listed oil producer, says the investments are just good business, and have nothing to do with politics. But the Kurdistan projects will produce just 10,000 barrels of crude per day by the end of this year — only 0.2 per cent of its total daily production: low on output and high on symbolism. Kurdistan has long been considered a close ally of the US. But the recent expansion of the Kremlin-controlled oil major has given Russia a significant foothold in Erbil. This is part of a trend mirrored across the Middle East as Moscow responds to a shrinking of US influence by stepping up its relations with countries such as Saudi Arabia and Iran. Rosneft in May signed an agreement with the Kurdistan regional government to explore the potential of developing its natural gas reserves and building a gas pipeline. This could in theory carry exports to Europe in one of a string of deals made between Mr Sechin and Erbil over the past two years. Over the past 18 months, the Russian company has paid about $3.5bn to the Kurdistan administration including: $400m to develop five exploration blocks; $1.8bn for control of the region‌s export pipeline, and a $1.2 loan in pre-payment for oil produced by companies other than Rosneft. While that has provided a financial lifeline to the region‌s government, it has angered the Iraqi administration in Baghdad, which says Erbil does not have the right to sign commercial deals with foreign oil companies without its blessing. “In accordance with our constitution, only the central, Baghdad government has the authority to sign such contracts and so those ones are illegal,” said Iraq‌s ambassador to Moscow, Haidar Mansour Hadi. 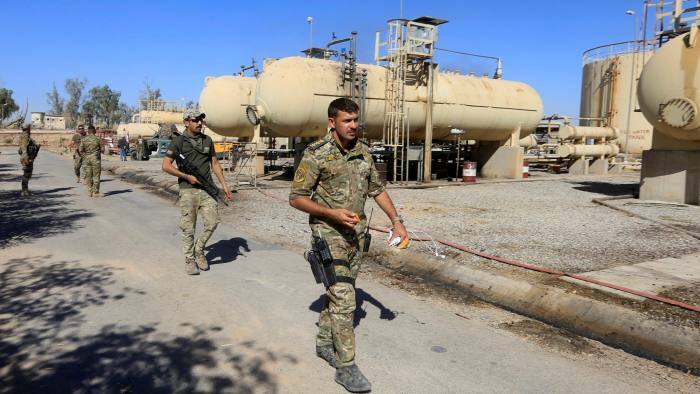 After Kurdistan held an independence referendum in September 2017 — condemned by the EU, US and Turkey but not Russia — Baghdad sent troops to seize control of major Kurdish oilfields, disrupting the region‌s critical oil production and exports. That makes Rosneft‌s control of the export pipeline, which pumps Kurdish crude to Ceyhan on Turkey‌s Mediterranean coast, a key lever in relations between Erbil and Baghdad, and places the Russian company at the centre of talks between the two. Despite the military intervention last year, and the legal war of words over his already-signed deals, Mr Sechin doubled down in May with the gas pipeline agreement. If Rosneft were to go ahead with the pipeline, which could carry billions of cubic metres of gas to Turkey and Europe, the Russian company would have unrivalled control over the region‌s energy exports. Kurdish natural gas — alongside Rosneft‌s 30 per cent stake in Egypt‌s massive Zohr gasfield— also gives Mr Sechin an opportunity to compete in the European market against domestic rival Gazprom Neft. But analysts say that whatever the potential financial pay-offs, Rosneft‌s Kurdish projects are more than just canny business deals, and that where other international oil companies see political risk, Mr Sechin sees political opportunity. “In Iraq, Russia is looking to leverage its strong position for a broader political role and become an indispensable player in the country, just as it has done in Syria and is looking to do in the Middle East more broadly,” he added.